Nordic skiing is a lot different from downhill in that respect. Being a beginner on downhill skis, especially as an adult, looks uncomfortably difficult, a sentiment my adult friends new to downhill skiing readily confirm. But that’s not the case with cross-country. It’s easy to be a beginner cross-country skier and still have a great time on the trails. Sure, you might not look particularly graceful. And it’s probably going to be more of a workout than if you actually had some technique. And, yes, it will take you longer to get where you want to go. But falling isn’t a concern — you’re never going fast when you do tip over so it’s hard to hurt yourself — and it’s not jarring on your body the way downhill can be. It’s a low-stress, all-ages, beginner-friendly sport. It’s also great exercise. You’re outside in the fresh mountain air with incredible views and serene surroundings. What could be better? My husband and I started doing a lot of Nordic skiing together last year (well OK not a lot a lot – we didn’t do enough to actually get any good at it), and we’re enjoying it again this year. Lessons are definitely on the docket – I’ve decided it would be nice to know how to actually glide, steer and stay properly balanced on those spaghetti-width edgeless sticks they call skis. All of the cross-country skiing we do takes place at Dawn Mountain Nordic Centre, located very near the ski hill up at KHMR (go past the parking lots, hang a right at the four-way stop and follow that road right to Dawn Mountain). Being a novice, I admit I don’t know a lot about Nordic ski centres (the only other one I’ve ever been to is the one in Canmore) but it strikes me that Golden’s is a pretty darn good one. There’s over 33 kilometres of skate and classic skiing at Dawn Mountain, plus another six kilometres of classic trails at the Golden Golf Club (cross the one-lane bridge as if you are heading up to the ski hill then hang a right at the sign; that road leads directly to the golf course). Top Canadian trail designer Don Gardner was brought in to help with the design. Add to that the ideas and efforts of many other talented and dedicated players, and the end result is that every metre of Dawn Mountain’s trail system has been designed for the best skier flow, best use of terrain, best views, and avoiding important habitat and forestry values. In 2012, Dawn Mountain hosted the Canadian Masters National Championships. They also host the Huckleberry Loppet every year – a huge and fun event for all ages and abilities. One day is for skate ski races, the other day for classic. I actually learned these tidbits just the other day. My husband and I had just finished our ski and we struck up a conversation with Jeff, president of the Golden Nordic Ski Club. Jeff’s been involved with the club since its early days and has played a big role in helping the Nordic Centre and the ski club become what it is today. This is something you will notice immediately if you go up to the Nordic Centre – the people there are super excited to have you out and they are enthusiastic about everything Nordic skiing. You will most certainly be greeted with a friendly — and helpful — welcome. 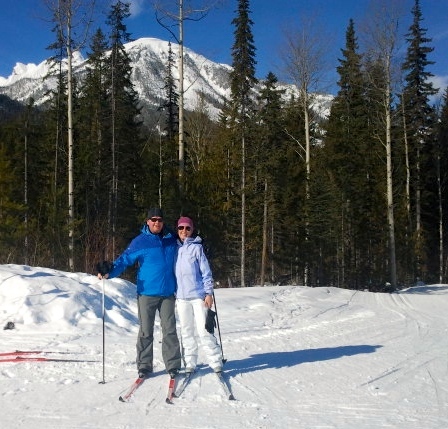 There’s is a good chance you will meet Wayne, who owns the rental shop (he’s also the club vice president and another key player in the helping the Nordic Centre develop into what it is today). Wayne is a friendly guy and I often see him meeting and greeting new skiers as they come into the chalet, helping them to sign in, get oriented to the trails, and get on their way. He helped us on our first day, as well as on a number of days since. It all adds up to a relaxed, serene, authentic experience. There’s an understated splendidness to it all. Pretty much just like Golden itself.